Briana Ore is the lead trainer at Freedom Service Dogs. She has been a trainer for eight years. Freedom is over 27-year old agency that trains dogs for veterans, and others with physical challenges. “Bri” started from the “ground up” at freedom. She has a degree from the University of Vermont in Zoology and worked as a pharmacy tech in Vermont before moving to Colorado and discovering her passion. 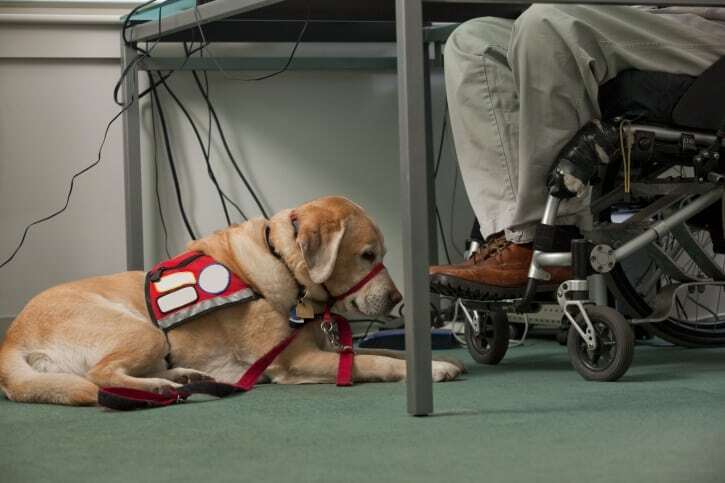 I spoke with her last year in an attempt to understand more about assistance dog trainers. I have incalculable respect for trainers, their patience, their ability to create miracle workers out of discarded dogs that go on to enhance and even save lives. Lon Hodge: What made you want to consider training as a career? 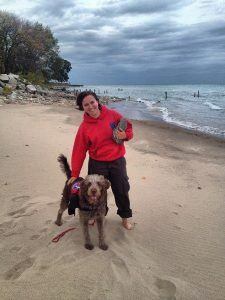 Bri developed a very obvious bond with Lon’s service dog, Gander, during his training. Bri: As I studied Zoology in Vermont I know I wanted to work with animals, but had no idea what path that would lead me toward. I worked in the family business, pharmacy, in Vermont but longed to be doing something I loved. After only three weeks, I started at Freedom and never looked back. Lon: You once told me that Patricia McConnell (Author of The Other End of the Leash, For the Love of Dog and others,) someone we both know, love and admire, was a big influence. Bri: Patricia is a Zoologist and my teacher ay Vermont was a big fan. I loved the idea of positive reinforcement, as opposed to punishment or deprivation, as a way of training animals. 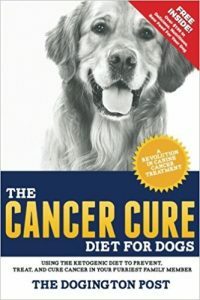 I had lived with dogs all my life and had a great love for my first dog, Shake, and wanted to know more about how to positively influence relationships. 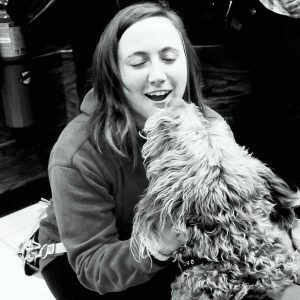 I took an animal companionship course and fell in love with the “why” behind our connections with animals and how to make them better. I longed to find a common language that could bridge the gap between us. Lon: What was your early work like in this field? Bri: Well, at that time Freedom was quite small. We worked out of a storefront with only the founders: four employees total. And I loved their mission. We were rescuing dogs to rescue people. We had four clients. Now we serve 30-35 a year. In those days we worked mostly with people in wheelchairs with major mobility needs and challenges. Lon: When did the work with veterans start? You were one of the early agencies to consider the special needs of this group. Bri: That started in about 2008. We placed two dogs that year with veterans. We had an amazing dog Sierra, that like your Gander was incredibly special, and we sought out a special fit client. It was a match made in heaven. Sierra sadly passed way passed away just last year. Lon: How did your training progress? Bri: I started out as a kennel care tech. Lon: So, that means you spent your time cleaning up, right? Bri: Yes, I (laughing) basically scooped poop and washed out crates. But, because we only had ten dogs on site I had time to begin learning dog training skills. Lon: Are you Assistance Dogs International (ADI) certified as a trainer? I know that the VA and other government agencies are looking to require the dogs they use or support be ADI certified agency trained. Bri: Freedom is ADI certified and two of our trainers are certified. We have been spending our time getting as many quality dogs as possible to as many people in need as we can. But, now that we are national in scope we feel we need to hold ourselves accountable to uniform training standards, via ADI and other groups, for the benefit of the dogs, and clients. Lon: Tell me one of the best things that come to mind as you reflect on the past few years as a trainer. Bri: The prison program. I have been involved from the ground up. I see it as one of our biggest successes. My parents didn’t find my sense of humor too keen when I first called them to say I was about to go to prison. It fits so well with our mission. We receive top dogs trained by prisoners hoping to better their lives. It is rehabilitation for the inmates, it makes shelter dogs more adoptable and it helps us locate dogs who will be suited for saving or bettering the life of a veteran or person needing an assistance dog. Our original motto was ‘Rescuing dogs to free people.” Whatever happens in the future, if my role at Freedom changes, I always want to be associated with the prison program. It is so important and so rewarding. You know that because you have been a recipient of one of those dogs. Lon: And my life will never be the same. And I was able to correspond with the inmate who trained Gander and will speak to the women’s prison where he was first trained in basic skills, soon. They need to see how powerfully they have affected at least two lives. Lon: What is one of your pet peeves about this industry? Bri: It is not the industry that troubles me. 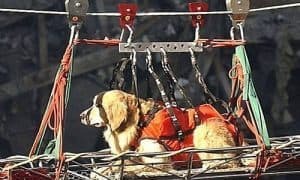 It is the “fake” service dog businesses and the people who try to save a few dollars with the hotels and airlines by putting a vest on an untrained dog. It puts our clients and dogs in danger and creates access problems for them. Lon: I heard that some of the prison programs are moving away from training service dogs. Why? Bri: It is a certification issue. Inmates cannot, obviously, get away from the prison to do some of the socialization and public access hours required by the ADI. So, they have moved to skilled companion training and less restrictive programs. They once did a lot of their own service dogs, but now pass on those dogs to us. It is a shame because the demand for quality service dogs is so high and they did a wonderful job. 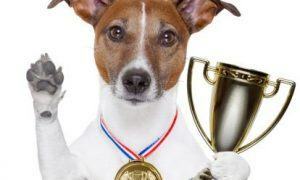 Lon: How do you decide what dog should be trained for a client? Bri: It is as thorough a screening process as possible. There are medical certifications required, an interview, a home inspection, and a session where several dogs are introduced to the client to get a feel for a “best fit” and more. Lon: What is the wait time for a dog now? Bri: It varies upon need. From as short as six months to two years or more. Lon: What is the biggest obstacle in the matching procedure? Bri: Larger dogs are increasingly hard to come by. We only use rescues and temperament, health age and trainability are just a few of the things we look at when we take on a dog. 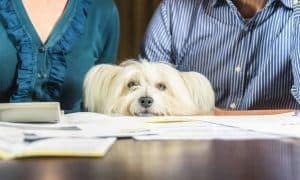 Lon: After all that, what happens if a dog does not make the grade? Bri: We adopt them out. We only allow Colorado residents to adopt the dogs so we can ensure they are well cared for after adoption. 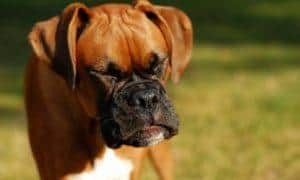 Lon: What has caused a dog to fail? Bri: Likes to chase squirrels, has trouble with other household members, reactive to noises in public. Things like that. They are sentient beings and they have personalities quirks just like we do. Lon: Freedom, when I applied for a dog, only accepted applications from potential clients with primarily physical challenges. You trained the dogs for psychiatric needs if there was a dual diagnosis, like PTSD, but physical disability was at the core. Tell me more about that. Bri: We did that because the Americans with Disabilities Act at that time had few provisions to protect a client with a psychiatric service dog. That has changed and so have we. We now have a PTSD only dog program, but it is for former military only. That is because we interface so well with the VA and military referral sources. We can easily interface with their case workers and do a better job of training the dogs to meet specific needs. And we can follow up with their care and make adjustments as needed much more easily. Lon: What is your acceptance rate now? Bri: I would say about 50%. Lon: How does that work and why are some folks not brought in to the program? Bri: We only work with PTSD, we have become very good at training for those needs, and we have not branched out into other psychiatric disorders is a big reason. Some issues tend to get in the way of the client-trainer relationship and we are not qualified as counselors or therapists, and we want to be able to do the best job and have the most impact possible. And the best fit for dog and client. And the safety of the dog is at the top of our list. Some disorders may threaten their comfort. That is a hard decision to make. And we require that PTSD clients be 6 months to a year away from the traumatic incident so they are well into treatment and better able to care for and benefit from a service dog. Everyone’s timeline is different. 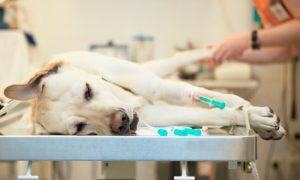 We want to be sure that the dog will be of benefit and not an added burden. Dogs are not a magic bullet. They are adjunct to a good care program. Lon: Maintaining a service dog is a lot of work. Many people wish they could have a dog 24/7 but do not understand the huge responsibility they are taking on. Lon: What is the biggest challenge you face in this work? Bri: The people. The dogs I understand, because I spend a great deal of time with them. It is hard to totally and accurately assess the appropriateness of a client through doctor’s reports and our interview process, as good as it is. 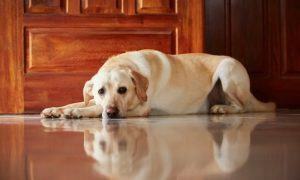 Some clients are reticent to talk about some of the special challenges they face or that the dog may face. Lon: Some dogs come back to agencies for a variety of reasons. What are some of the reasons a relationship does not work out? Bri: We offer lifetime support, so we can fix or work on issues that were not apparent during training. But, sometimes a dog needs to come back for more training or for less challenging duty. We adopt out any dogs that do not meet our high standards. And sometimes a bonded fit does not happen. And there are issues with the clients we cannot always anticipate that require us to take a second look. We had a terminally ill client and the emotional climate became too difficult for everyone involved. The service dog was replaced with an emotional support dog that required less work for the family. The biggest number of dogs returned to us, and it is not many, come from our veteran clients. The dog may be drawing them more attention than they expected or than they can handle and it be more work to integrate into their lives than was anticipated. And veterans, like you, come from a culture where it is difficult to admit the need for extra care and attention. Service dogs require a lot of work if they are going to be of maximum benefit to the client and it can be more daunting than first thought. And too, sometimes family jealousy can come into play. The dog becomes central to the client’s health and well-being. Lon: I understand. I am learning every day how to best utilize this amazing dog. And it is not always easy. Lon: What do you want to be when you grow up? What do you want to be doing in five years? Bri: Exactly what I am doing right now. If I can spend my life doing this, I will be the happiest person alive. What could possibly be better? I get to rescue dogs from shelters, help inmates get their lives on track and match these dogs with amazing clients whose lives are forever changed. I love that! I would keep every one of these dogs if I could (laughs) but I get to give them new lives and send them somewhere where they will do so much good. Lon: Thank you for what you do. Thank you for giving us both a new and wonderful life. Lon Hodge is Gander service dog’s human and travels the country with Operation Fetch, advocating for service dogs, educating about the human canine bond and the importance of service dogs in recovery from physical and emotional trauma. 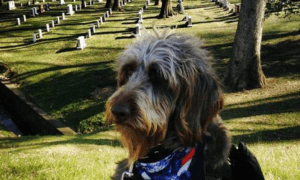 Gander was the AKC Award for Canine Excellence recipient in the service dog category in 2014-15, the Rotary International Humanitarian Patriot Award Winner in 2015, The Chesty Puller Awardee for Service Above Human Understanding, the Oscar Mike Apparel Hero of the Month for December 2015 and a nominee for the American Red Cross Military Hero Award. Follow Gander and Lon on their travels at http://facebook.com/ganderservicedog or http://operationfetch.com.